Monitor lizards live everywhere it seems, from the African Continent, spread across all over Asia and all through Indonesia. Monitors have a high metabolic rate, and are capable of actually catching their own prey as opposed to scavanging. It is of recent discovery that they may have a low bit of weak venom. This lead to the hypothesis that all venomous lizards are dirived from one common venomous ancestor. The word Varanus derives from the word Waral which in Arabic translates back to English as Monitor. Legend has it that these lizards warned people when crocodiles were nearby. Varanids are very intelligent, and some species are even clever enough to count. In studies done at the San Diego Zoo, varanids were able to count the number of snails they were eating, up to six.Komodo dragons recognize feeders and have different personalities. The most commonly kept monitors are the savannah monitor, white throated monitor, and Acklin’s monitor, due to their relatively small size and ease of domestication. Nile monitors, water monitors, mangrove monitors, and papau monitors have also been kept in captivity. Like all reptiles that are kept as pets, monitors need hiding places, and an appropriate substrate (bedding). Monitors also need a large water dish in which they can soak their entire body. 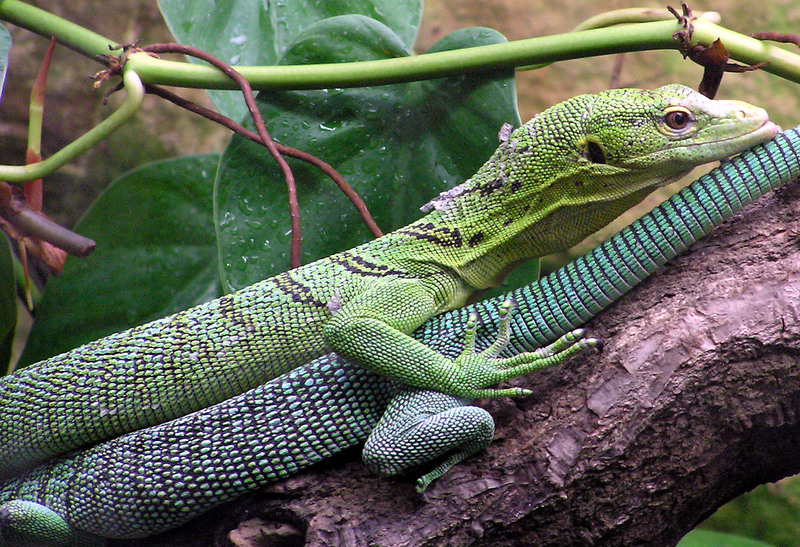 In the wild, monitors will eat anything they can overpower, but crickets, superworms, and the occasional rodent make up most of the captive monitors’ diet. Boiled eggs, silkworms, earthworms, and feeder fish can also be fed to monitors. Monitor lizards have been compared to reptilian cats – independent animals with different personalities. However, due to their predatory nature and large size some monitors can be dangerous to keep as pets. Adult nile monitors can reach seven feet in length, and are stronger than an alligator of equal weight.